The director (Harold Berens) calls, "Cut and hold" and, after checking with the cameraman, "Print!". 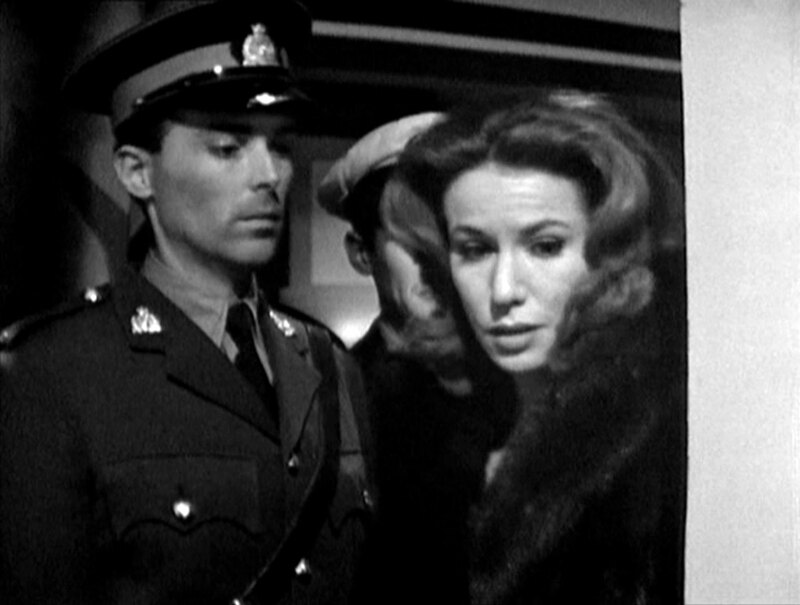 He tells the actress, Carla Berotti (Patricia English), she was marvellous then tells the crew to set up scene 28 so they can "get it in the can before she breaks up". Carla asks her understudy, Peggy (Pamela Ann Davy), to fetch her pills but when she goes to Carla's dressing room she's grabbed by a man with an eyepatch who is searching the room. When he realises she's not Carla he apologises, then kills her with a stilleto. Some time later on board the MV Calpurnia, stewards (Peter MacKriel and William Swan) rush to and fro under the watchful gaze of Pearson and Nicholson (Eric McCaine and Mark Eden) and the receptionist (Angela Thorne) welcomes aboard a late passenger, who announces himself as Budge Jackson (Gerald Sim). Guido Marson (John Bennett) is guarding the door of Carla's flower-strewn cabin where she is fielding questions from the press (Malcom Taylor, Terence Woodfield, Leslie Pitt, William Buck and three extras). Sheila (Iris Russell), controls the session and stops discussion of the murder. She's setting sail for Montreal "because she lives there" and dismisses comments about the unfinished film. The ship's horn announces departure and the reporters are ushered out. Sheila stops Carla from downing more whisky and summons the ship's doctor. Dr Martin King arrives and is grudgingly let in by Marson, but Carla is horrified to discover her usual doctor, Dr Benson, has been replaced. She's aggressive at first but warms to him when he doesn't stop her drinking. She tells him she's a hypochondriac, living on her nerves, but he sees that she's afraid - she blames it on Peggy's murder, and tells Dr King that public figures attract cranks. He gives her a sedative which she takes with champagne then has a fit of hysteria before it kicks in; he slaps her and she calms down after she slapps him back and he goes outside to fetch his nurse, Judy (Gillian Muir). He buttonholes Marson before returning to his cabin, finding Nicholson there. Nicholson says he was making sure he'd settled in and introduces himself as the Second Engineer. He invites him to the Captain's table for dinner then asks how long he's been looking after Miss Berotti. Nicholson says he disapproves of actresses who only have looks and no talent. As he leaves, he says the Captain won't be at dinner that night as they're stopping at Le Havre for passengers and mail. Carla receives a 'phone call and sends Judy into the next room, the voice on the line tells her to meet him on the boat deck and she hurries out, telling Marson to keep Judy in the cabin. When she gets to the boat deck, she embraces Nicholson who asks her for a microfilm and wants to know why she didn't get rid of it in London. 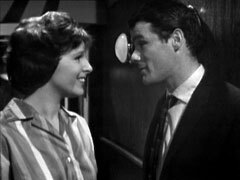 They hide when Budge appears and Marson meanwhile convinces Judy to stay put and let Carla have a rare moment of privacy - back on the boat deck, Nicholson asks if she knows whether the doctor has been sent by the other side, and tells her to meet him tomorrow night at 11, and to bring the film with her. Dr King emerges from an upper deck as they leave. At Le Havre, Steed joins the ship - as a steward - and takes a drink to Dr King's cabin, which he consumes himself after the doctor signs for it. Dr King reveals she made contact with someone about an hour ago, but he didn't see who or hear what they said. Steed tells him film of the new Dew Line defence installations has been stolen, and a member of the spy network captured in Montreal had a list of the Calpurnia's sailings and Berotti's name. They assume she still has the film as it didn't turn up in London; furthermore, Carla normally flies - unless she can get a berth on the Calpurnia. Sheila arrives and King discovers she's one of Steed's informers after he invites her in. Meanwhile, Peggy's killer comes aboard and tells the receptionist he's A.G. Brand (Alan Curtis). 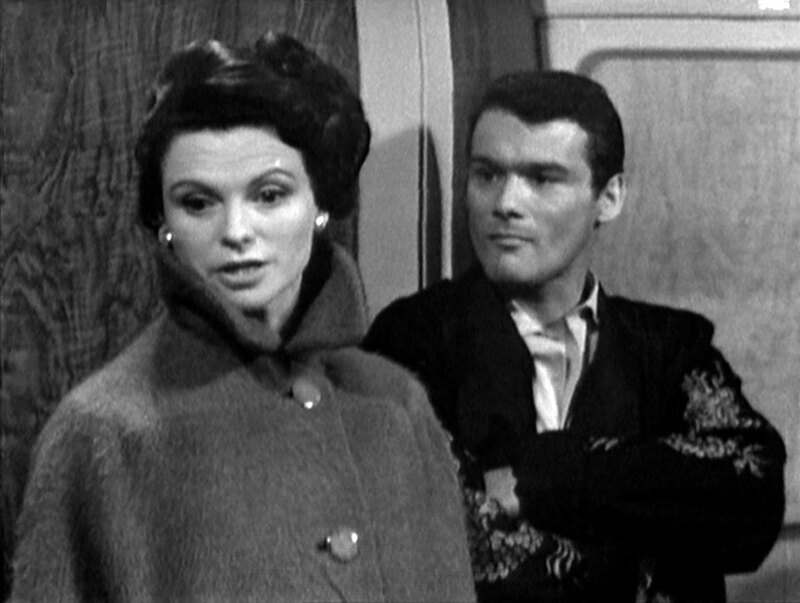 The next morning, Carla is talking to a passenger (Derek Fawley) who goes to fetch his autograph book as Nicholson approaches. Nicholson asks why she didn't show up last night and is astonished to discover she no longer intends to hand over the film. He tells her that as her husband, he knows what right for her; and she questions that too. In the ship's bar, Brand orders a whisky and dry from the barman (Allan Casley), then offers Sheila a cigarette which she politely declines saying, "No I don't smoke, at least not in a public place". Brand says, "That's an old fashioned idea", and she replies, "I'm an old fashioned person" then leaves abruptly. That night, Carla locks her cabin door then quickly hides the microfilm in a pill canister. She rings for a steward; moments later, Steed interrupts Nicholson and Dr King talking on the foredeck to tell King he's wanted in Suite B - Carla's room. Nicholson queries Steed as he departs, but seems satisfied to learn it's his first passage on the ship. When King arrives at her cabin, Carla throws the pills at him, telling him they don't make her sleep and he treats her like a child. He puts them down and she requests a shot of morphine which he refuses to give her. He goes to prepares a neuraligia medicine with hot water and she hides the pills in his bag. 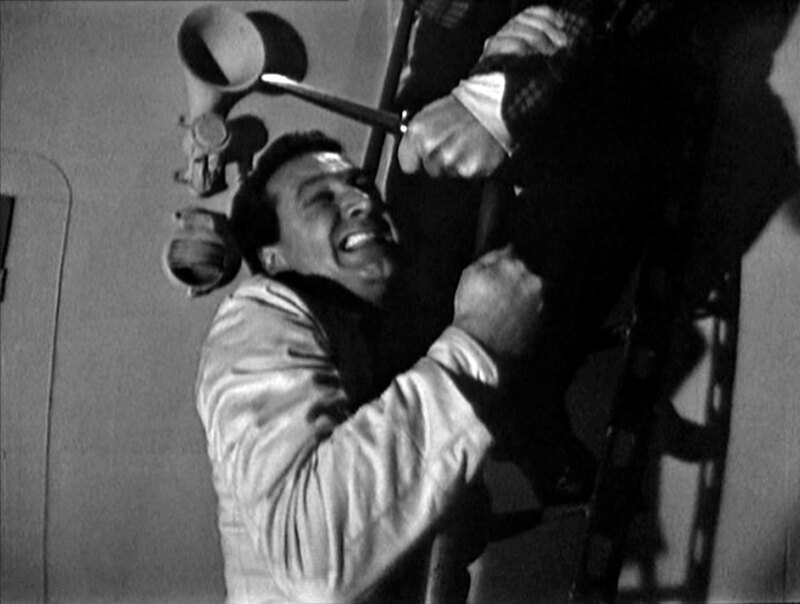 Steed descends a ladder to the boat deck to wake Dr King, who's wrapped in a blanket on a deckchair. King asks if the drunk has come round yet and Steed informs him he's had his throat cut. They head to his cabin and Nicholson appears, concerned about what he's just overheard. King starts cleaning up the mess in the cabin and Steed reasons the killer thought he had the film. when he finds Carla's pills Steed seizes it and finds the film inside, much to King's dismay. He goes to her cabin and convinces Marson to fetch some medicine from the dispensary then enters. He challenges Carla with the pill box and tells her about the drunk's murder, demanding an explanation. 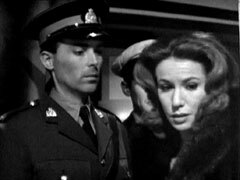 She refuses to tell him anything and he goes to meet Steed on the top deck, who tells him he can't get the captain to protect her as he wants to catch all the agents on the ship. He's learned that the agents don't know each other and use counter-phrases for identification, the group leader declining a cigarette from an agent with the words "No I don't smoke, at least not in a public place", the agent replies "That's an old fashioned idea", and is told "I'm an old fashioned person"! Steed is called away and is in Carla's cabin when Sheila arrives and tells Marson to go off duty as Carla will be at the fancy dress ball. She tells Steed that Carla isn't the courier as it's not in her world, and makes him a drink. He tells her she's wrong and startles her by revealing they already have the film. At the fancy dress ball, Sheila and Brand pressure Nicholson to kill Carla and he finally agrees, Brand telling Sheila he's kill Nicholson once he's done it. Nicholson calls Carla to the boat deck and she's followed by Steed. Brand watches from the shadows as Nicholson tries to lift her over the railing and stabs him when she screams and escapes his clutches. He tells her to run and Steed tackles Brand from behind; they fight and Brand is disarmed but escapes, Steed chases after him just as Pearson arrives, discovering Nicholson's body. Steed catches up to Brand and knocks him out. The next morning, Brand, Sheila - and Carla - are led out by the Canadian police, Carla stopping to say goodbye to Dr King, who is troubled by her arrest. Steed half-turn to answer a call for a steward, then smiles and suggests they have a party, summoning a steward himself.